Her village was about as poor as you can get. Her father was a fisherman until the fish ran out! He works when he can find it and his little family makes do with what they have. The one thing that jumps out at you when you meet this family is not the poverty but the over whelming love they have for their children. 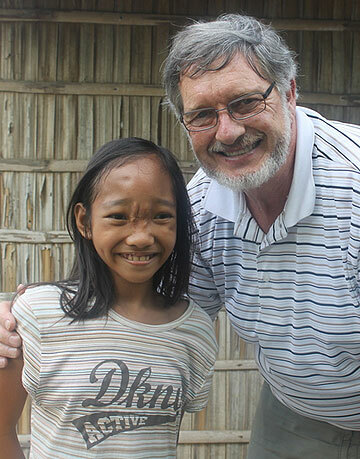 Like many children in the Philippines, Miss M was born with not quite all her skull bones fully developed due to a lack of nutritious food available to her mother. As a result, fluid would leak from her brain cavity through a pin prick hole in her skull and form a sack hanging from her forehead. To repair this problem was completely out of the families financial abilities. That was until a team from the Ruel Foundation came through the village. Miss M immediately caught the eye of Pauline Curtis-Smith, The Foundations Philippine Director. Once again the long journeys from Calapan City to Manila began. The surgical solution was to literally peel her face back repair the hole, not a pleasant or cheap operation. Once the initial operation was completed we had to wait until Miss M was twelve years of age before we could start the plastic surgeries. The most moving part of Miss M's journey was that this little girl was always positive, bright and happy. 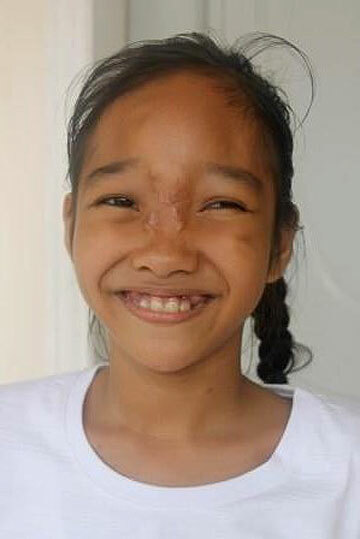 Her disfigurement never bother her thanks to loving caring parents and our Ruel Foundation team. While Miss M may have to have more plastic surgeries when she is a bit older she is thrilled with her new looks and attends the village school, just outside Calapan City, every morning. Thanks to our donors and the several thousand dollars they donated, this beautiful little girl now has a bright future.